A weekly podcast for nontraditional premed students. Listen in Apple Podcasts (iTunes), Stitcher, or any other podcast app. We cover everything that you, the nontraditional student, needs to know. We’ll talk about the MCAT, applications, life as a doctor, and so much more! All for free! Check out our forums, where we take the questions from. New episodes of the OldPreMeds Podcast are released every Wednesday. To make sure you don’t miss an episode, subscribe for free using the links below to get the show on your device automatically each week! 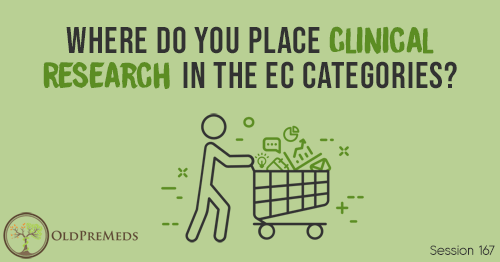 Where Do You Place Clinical Research in the EC Categories? Will Competency-Based Degrees Work For Med School?